My final challenge for today! This one from Stamp Something. Their challenge is to use 'Showers and/or Flowers'. I have used a Miss Anya stamp from The Greeting Farm as my image, coloured with my Promarkers. The gorgeous flower is a combination of two from Prima. The papers and ribbon are from HOTP. Stampin' UP! Scallop circle and circle punches used to create the sentiment mats and the sentiment itself is from the Stampin' UP! Circle of Friendship stamp set. 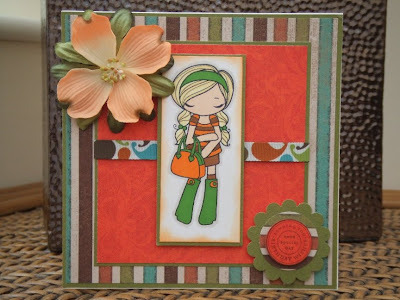 Lovely card Teri, lovely colour combo and the prima flower is fab. What a great card - I love the colour combo you used. THanks for stopping by my place as well. she is so diva-licious! The flowers are fabulous ! Your card . . . amazing as usual! I love the Miss Anya stamps. Gorgeous card and lovely colours! Beautiful card!!! I like your cilour-combination, great!! And the image, and the lovely details too!! Stampin' UP! - Open House Day! !